During an action packed career, Keith Glass survived the 60s, became a music icon in hometown Melbourne, and was responsible for instigating a goodly slice of 70s/80s Australian music history, prior to building a 100 song recorded catalogue. In the late 1980s Keith was signed to the Virgin label for two solo albums. These were followed by three albums as one third of Glass/Hamilton/Young. 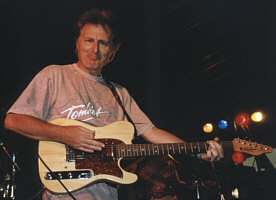 His next solo album 'Smoke & Mirrors' made critics end of year lists in 1998 and garnered many nominations and more than a few awards, with the song 'Larrikin Town' becoming a staple of ABC Radio. The cover of 'Southerly Buster' (1999) featured Keith and his Tomkins Diamondtina II that includes a Piezo system. The album gained a 'Best Independent Release' for the duet with Lyndsay Hammond 'Standing In The Way Of Love' and continued the critical raves. Keith's latest album is entitled Australian Soul and it sums up all the influences that have gone into his lifetime in music.